Waldemar welcomes Zaha Hadid’s new Serpentine Gallery — but is it better news for foodies than for British art? London has a new art space. In most instances, an immediate hurrah would be in order. Art is a reliable barometer of a nation’s health, and the more venues there are for showing it, the better. But in this instance there are complications. First, we are still stumbling out of the worst economic recession in modern history, so the lavishing of a rumoured £14.5m on this new art space can be viewed as an indulgence. Second, the new gallery is an offshoot of the Serpentine Gallery, in Kensington Gardens, which has lost its way of late. There was a time when it played a crucial role in British culture, when the enlarging of its empire would unquestionably have been an event to cheer. But that was then, not now. The new space is actually an old space: a former gunpowder store in Kensington Gardens, built in 1805 to prepare for Napoleon’s invasion of Britain. Seven minutes’ walk from the old Serpentine Gallery, over the airy Serpentine Bridge, it has been treated to a foundations-to-weather vane refurbishment by the world’s trendiest architect, Zaha Hadid, who has also added a typically tenty extension on the left. 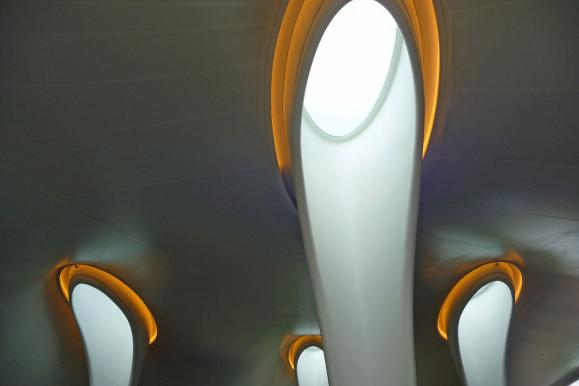 The extension is strikingly white: Hadid’s trademark. Thus, its relationship to the old gunpowder store is the kind of relationship that wedding marquees have with country houses. Inside, the sense of separation continues, as the bricky nature of the converted gunpowder store contrasts dramatically with the exquisite swoops and slides of Hadid’s modernist yurt. The yurt is lovely. Shockingly, though, it’s just a restaurant. The entire extension has nothing to do with art, and is instead a plush new eatery in which a fashionable chef called Oliver Lange will be inventively combining sushi with fillet of beef. A few years ago, in a deeply misguided advertising campaign, the Victoria and Albert Museum proclaimed itself “an ace caff with a nice museum attached”. Today, up the road at the new Serpentine, that misjudged dream has finally been realised. It isn’t every day you get to eat sushi and beef in an ace caff designed by Zaha Hadid, true. But as a cultural statement, a message to the rest of the nation, the lavishing of this much space, money and attention on a must-go destination for the fine diners of London is misguided to the point of being offensive. The actual galleries, meanwhile, add 900 square feet of characterful exhibition space to the Serpentine’s territory. It’s characterful because the old gunpowder store was a lofty sequence of brick rooms, domed and narrow, whose warehouse identity has been carefully preserved. The new galleries have something of the romanesque chapel about them, and I am obviously not the only one who thinks so, because the first artist to be let loose in here, the Argentine installation artist Adrian Villar Rojas, has added a pair of stained-glass windows to his final room, making its austere religious mood explicit. 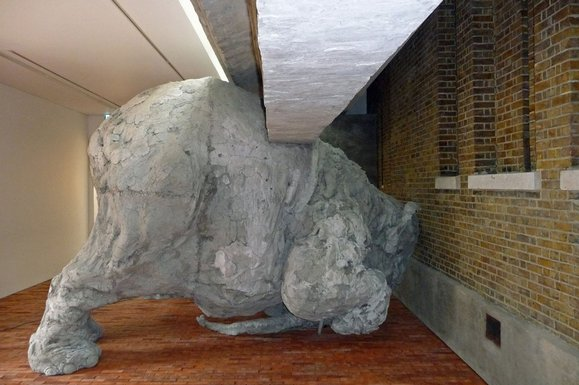 Villar Rojas works mostly in clay, a material with close genetic links to brick, so most of his contribution sits happily inside the bricky spaces of the Serpentine Sackler Gallery, as the new venue is officially called. In a clever move, Villar Rojas has also lined the floor with bricks, creating a fragile surface across which you creak, more aware than usual of the world under your feet. In another clever move, the first sight that confronts you when you enter is the huge backside of a clay elephant. It reminded me immediately of Caravaggio’s Conversion of St Paul in Santa Maria del Popolo, in Rome, where much of the picture is taken up by the backside of a horse. In baroque times, Caravaggio’s unexpected foregrounding of some equine buttocks served instantly to engage the audience. The same thing happens here. The huge elephant arse creates the interesting gallery sensation of pushing you out of the building, rather than welcoming you into it. In the final instalment of his British debut, Villar Rojas fills the last of his bricky spaces with a selection of clay sculptures packed onto shelves, like plants at a garden centre. Apparently, the busy assortment of sculptures is a pocket retrospective of his career so far. And whenever my eye managed to distinguish a particular sight in the packed display — a wounded clay warrior on his back, receiving a transfusion from some recycled plastic bottles; two clay slabs squeezing a baguette — it was worth the attention. But lots of artists have now chosen this particular method of displaying their wares en masse, and as a display strategy it encourages you to miss more than you spot. Villar Rojas made his name on the international festival circuit — he won the Benesse prize at the 2011 Venice Biennale — and is exactly the kind of artist in whom the Serpentine has come to specialise. With two venues on its hands, it will be interesting to see whether the gallery continues to remain a landing pad for the Air Miles artists of the world, or if it uses the extra space to reconnect with British art. The next exhibitors will be the Chapman brothers, which certainly bodes well. But it remains to be seen whether this quintessentially British location will interact with its surroundings or continue to ignore them. How the two Serpentines will function together is another unknown. The current plan to link the spaces with an interstitial sound work that visitors can listen to as they walk from one gallery to the other is smart on paper, but the sound works were not yet available when I visited. So we’ll see. Back at the mother gallery, the Serpentine plumps once again for an international biennale star with a beautiful display devoted to the veteran Italian Marisa Merz.The recipient of a Golden Lion for lifetime achievement at this year’s Venice Biennale, Merz came to prominence in the 1960s as part of the arte povera movement, in which her husband, Mario Merz, was a leading light. His reputation overshadowed hers, and it is only recently that her delicate, elusive, ineffable art has been given its due. The current show is a condensed retrospective, beginning with the hanging aluminium pieces she produced in the 1960s and ending with the recent pictures of angels that so divided opinion in Venice. I was unsure too — angels in 2013! — but here the large cubistic deities, highlighted with gold, are a wonderfully numinous conclusion to a hushed and gentle journey. So, let’s sum up: beautiful Marisa Merz exhibition; promising Adrian Villar Rojas show; beautiful Zaha Hadid structure; criminal use of beautiful Zaha Hadid structure; unclear connection between the two galleries; unclear connection to British art. It’s all in the balance at the Serpentine.